Nasal bleeding is a common complaint presenting as an emergency. Epistaxis is often a frightening sight to all concerned. The nasal bleeding can be anterior or posterior (spitting blood) . and	Idiopathic â€“without any reason- the cause of bleeding may not be clear. and	Finger nail trauma due to excessive nose picking. This is the most common cause among the children. and	Trauma to nose due to road traffic accident or being hit on the nose by a ball or fist. and	Fracture of the nasal bones. and	Viral rhinitis (infection of the nose). and	Bleeding disorders â€“ when the patient has a deficiency in the system responsible for control of bleeding there is an abnormal tendency to bleed. Don\’t panic because most of the time bleeding can be controlled by pinching the nose tightly for about five minutes. Ice compress can be applied over the nose and forehead. They cause bleeding blood vessels to constrict and bleeding stops. If bleeding is profuse the patient should be taken to the ENT doctor. It may require inserting packs in the nose to stop the bleeding. Hypertensive patients should take their blood pressure controlling medication regularly. May Need Admission in a Hospital. If the bleeding area is identified, it can be cauterized by a chemical agent like Silver nitrate or Trichlor acetic acid under local anesthetic. 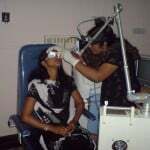 Cautery by laser is a better option than electric cautery which is very painful. A low power setting using a Co2 laser is being used in my clinic. This is done after spraying the nose with a local anesthetic and vasoconstrictor. After cautery, local application of Sicastat gelÂ® can be continued for a few days till the area heals well. An antihistamine tablet can be given to ease the sneezing. Profuse nose bleed if continues , the patient has to be taken to the nearest hospital where an ENT surgeon on call will see the patient. The patient need to be admitted in the Hospital, after inserting a nasal tamponade.